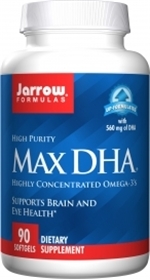 Max DHA contains omega-3 fatty acids from fish oil highly concentrated by molecular distillation. Max DHA meets the proposed USP monograph standards. The predominant fatty acid in the brain, nervous system and retina of humans is DHA, an omega-3 fatty acid. DHA is important for fetal and infantile neurological development. DHA also helps support neurological function in seniors. Take 1 to 2 softgels with each meal or as directed by your qualified health care consultant. For pregnancy or lactation, take 1 to 2 softgels per day; for children, give 1 softgel per day. NOTE: If you have a medical condition (especially seafood allergies or coagulopathy), are taking medications (especially anticoagulants), or facing surgery, consult your health care practitioner before using this product. Gamma tocopherol and ascorbyl palmitate added for protection of long-chain fatty acids. Softgel consists of gelatin, glycerin and water and is colored with caramel and carob as a light barrier. Contains: Fish (source of fish oil).